I was curious to see how – if at all – the top search engines decided to celebrate Halloween. The above collage collects the holiday logos. Don’t look too hard in the bottom right corner, there’s nothing there to see. 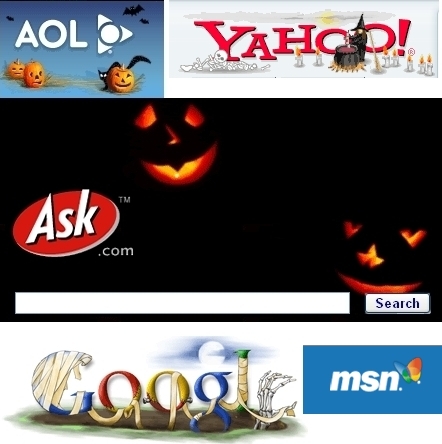 To be sure, MSN did have Halloween content on its homepage, but no special logo design that I could notice. The others all had something fun to greet users. Tonight I look forward to greeting trick-or-treaters. I don’t usually get to do that, but my impression is that there are plenty of little kids in my current neighborhood so hopefully they will be stopping by. Vivian’s recent comment wondering whether my work would interfere with my ability to post Friday time-sink amusements reminded me that I should not abandon my important role in keeping you from doing whatever it is that you had planned to do when you sat down at your computer. This weekend’s amusement is brought to you by Jeux Chiants (yeah, I know, you’ll have to excuse my French). Of the large selection, my highest recommendation goes to Double Jeu. You won’t miss much by not speaking French, it’s pretty self-explanatory. Just don’t let either ball drop. Hah, and doesn’t that sound easy? The one thing you’ll miss out on by not speaking French is the derogatory comments after you mess up. I managed to get up to 24.5 seconds. If anyone does it longer and understands the resulting comment, I’d be curious to hear if you ever get a true heartfelt congratulations. I thought Labyflou was reasonably amusing and you can get it the first time around. It’s also not addictive, once is about enough. Le jeu du ver is not bad. It’s one of those games that starts out almost too easy, but then gets significantly harder with each level. Finally, La souris est invisible is a good reminder of how dependent we may or may not be on visual cues when using the mouse. Click here for something cool. in three minutes, the largest dot will travel around the circle once, the next largest dot will travel around the circle twice, the next largest dot three times, and so on. Over the weekend I found a few fun Flickr tools. 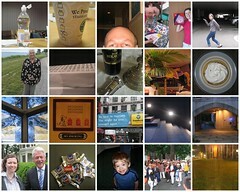 I’ve bookmarked these (see del.icio.us links), but they are worth a separate post. My favorite script from Steeev’s site is FlickrPM. It adds useful links next to each user’s name. You can now quickly find out whether they have any images in the Explore archives, view their images in order of interestingness, jump to their mail or profile page directly, all via a direct link right next to their name. There are several other goodies on that site, it’s worth a look. Another interesting Greasemonkey script imports information about the Upcoming event with which the photo may be associated. I no longer remember, but this may also be the script that lets you add a tag with Upcoming event information from your Upcoming event list seemlessly to any Flickr photo. Finally, for some fun, check out Museumr, which lets you place any of your Flickr images (or probably any image from anywhere online) in a museum setting. Here is an example. In addition to taking pictures of restroom signs, I also enjoy looking around for interesting license plates. There are plenty of these in Illinois, apparently one in five drivers has one. I find this somewhat surprising given their cost: $76 extra for personalized plates and $123 for vanity plates (and who knew there was a difference between those two categories?). I used to take a lot of pictures of them, but given the volume I have decided to focus mostly on ones that I can decipher and find at least somewhat interesting. 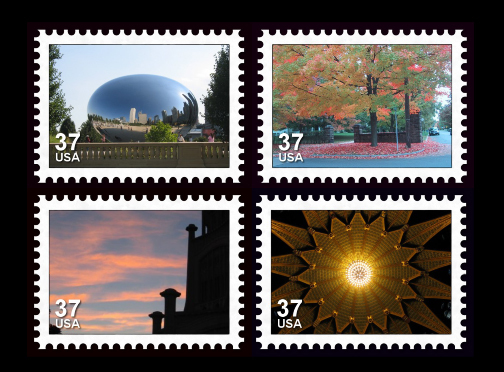 Some of my favorites: EUROPA, KODALY, MAKE ART, GENEVE 4 (although that would be cleaner without the number), GOOGLE and MR PHOTO. For that last one I reversed course and went back to park on the street and capture it. I am serious about my collection. :) Among others’ photos, I’ve especially appreciated finds that have some Internet-related meaning (FLICKR‘s the best), but some others are fun as well (e.g. GRUETZI) plus the ones that are not obvious to decipher (although if they are too cryptic I’m likely to miss the meaning). Others are just outright curious, for example, who knew emotional expressions about one’s Mom is a popular theme (I LOV MUM, ILUVMA). The issue of vanity plates can get tricky quickly as certain expressions are not always allowed. One has to wonder how closely suggested plates get scrutinized. Or would the reverse of a plate be checked (say, you want to send a message to those viewing your plate in their rear-view mirror, do state official consider the reverse reading of submitted requests)? Then there is the issue of specialty plates that support certain causes. The environmental ones don’t cause much contraversy, but the pro-life ones do. Illinois has a search program available so you can check whether your preference is available. It turns out that mine is, but I’m not ready to spend the $123. I guess I could always just get a bumper sticker. I see that there are plenty of vanity plates in Calfornia so I look forward to capturing those when I move there in a couple of weeks. This is pretty cute although it would’ve worked at least as well with a less violent theme. It would be interesting to see something like this with some of the more recent popular programs like Firefox. Not too hard to guess who would win. Anyone know of such a creation? Looking for a summer [or insert appropriate season] hobby? Consider joining the Flickr Monthly Scavenger Hunt group! As you may have noticed by now, I like maps. In fact, geography was the only elective I took in high school, two optional years in addition to the two required (no, I didn’t go to high school in the U.S. as you are likely able to guess from that info). Those classes included lots of material of less interest to me (e.g. leading mineral producers in the world and what shrubs grow in the tundra), but we also got to look at maps a lot, which was the main reason I was hooked. Given these interests, I was excited to find Quikmaps this morning, a service that lets you annotate Google Maps, save them, go back and edit them, and in the meantime post them on your Web site. There have been other related services (GMapTrack comes to mind), but none have managed to do this as well as Quikmaps. I have been using Wikimapia for some map annotation purposes, but it’s not so good when the locations you are specifying have limited appeal. The one problem with such independent little upstarts is you never know how long they’ll be around (e.g. GMapTrack is nowhere to be found) so it’s not clear how much time and effort one should spend creating maps. Nonetheless, if you want to explain to someone how to find you or want to annotate your favorite locations (or just restaurants) in town, this seems like a very helpful service. [*] I have purposefully avoided embedding a map here. I don’t want CT page loads to be too taxing on the Quikmaps site. It should be busy enough dealing with the digg effect . Upon entrance, you almost have to step on the projection of two people sleeping in bed to get to the receptionists and/or the elevators to access your room. I wonder how many people who notice this just walk right across the image versus how many decide to walk around the picture. Big plastic red penguins are scattered across the building, not just in the designated museum section, but also in the hallways. I didn’t care for some of the installations (like the film about a woman and a man having a seemingly pleasant dinner judging from their facial expressions despite the fact that mice are walking all over their food), but some of it was neat (like the falling letters on a screen where the viewer becomes part of the image). The hotel just opened this Spring. It’s a museum-hotel mix with various contemporary art pieces all over. The visit was much more fun than your usual hotel stay and it made me wish more hotels would put some interesting twist on the experience. Today (Friday), the Berkman Center for Internet & Society at the Harvard Law School is hosting a conference on Reinventing Public Media in a Participatory Culture. In addition to the face-to-face discussions, the conference is also integrating digital media in neat ways for participation by those who can’t be at the meeting physically. 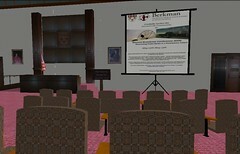 For example, there is a Berkman Island (including a 3D replica of the Ames Courtroom at the Harvard Law School) in Second Life. If you get a chance, come join us, it looks like there will be some very interesting presentations and discussions. You may have to be a pretty particular breed to appreciate the following, but I can’t be the only one around here. :) I found this Web 2.0 or Star Wars Character quiz quite entertaining. I scored 33 and while it is probably a sign of something positive that I didn’t score higher, I was still a bit disappointed. My point range gets the following recommendation: “As your doctor, I recommend moving out of your parents’ basement.” The whole thing is quite amusing, try it. Don’t look at the score chart until you’ve taken the quiz, you don’t want to spoil that part of the fun. Via Lifehacker, I found a helpful video on how to peel potatoes without too much trouble. Not wanting to pass on a recommendation without having tried it myself, I dutifully boiled a potato to test the method. It worked great! Note that the water at the end doens’t have to be ice water, it’s enough to put the boiled potato in some cold water. While we’re on the topic of how-to videos, if anybody missed the instructions for folding a shirt, it’s also worth a visit. I found it harder to follow than the potato-peeling guide though. It may help to look at this piece as well to figure out what’s going on. I haven’t made this technique part of my everydays, but depending on your current method you may decide differently. I started playing ping pong again a few weeks ago so I may appreciate this more than most, but I don’t think you have to be a practitioner for it to be worth a look. While we’re on the topic of ping pong, check out this massively multiplayer online pong game. It’s not so much that it’s hours of fun (it’s not), what’s intriguing is that people come up with and create these things. If all this has gotten you in the mood for some pong then try king pong [requires Shockwave]. It’s a pretty good version of a game that probably has hundreds if not thousands of variants. I guess at this point I should probably include this here: . Thanks to Geeked for the Ping pong link and Waxy for the MMOP link. I found King Pong all by myself (well, with a little help from a search engine). A propos gender, I wanted to say a few words about some recent photo interests. A few months ago I decided to start taking pictures of gender signs. The most obvious location for these is restroom doors. I haven’t encountered any awkward situations yet running around public bathrooms snapping photos, but I can imagine eventually I may get some curious glances. The purpose of this exercise is to see what are the core essential elements that the designers of such signs decide will be enough to distinguish between men and women. We are all used to the stick figures, with and without the skirt (or would that be a dress?). But how about the more innovative approaches? In the Hungarian Parliament, the emphasis on the signs seems to be on differences in hairdo while the signs in the Hungarian Academy of Sciences emphasize some facial feature variation (lips vs moustache) in addition to hairdo distinctions and some differences in clothing. (It would be interesting to know the date of these two pairs of signs, I guess I didn’t do adequate research.) In other cases, the focus is on how men vs women tend to go about their business, but sometimes the distinctions are not completely obvious (these tend to be some of the most intriguing cases). I have compiled my photos on the topic into a set on Flickr. More interestingly, I also started a public group on Flickr (a pool of pictures to which any other Flickr member can contribute), which has led to the addition of some great photos from others, for example: this Ken and Barbie pair at the Shirn museum in Frankfurt. The rule for the photo pool is simple: post images that have both the male and female symbol (either in one or two pictures) and give some description of where the signs are located in case others want to find them. I welcome contributions! Join the trend, don’t be shy to whip out your camera next time you spot a pair of gender signs. Eventually, I could see this project leading to.. well, perhaps not a coffee table book, but maybe a bathroom book? Create your own light installation! 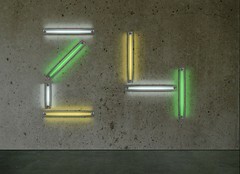 The Hayward Gallery is hosting Dan Flavin: A Retrospective (this seems to be the one that was at Chicago’s MCA recently) and has a fun interactive site to go along with it. You can create your own light installation dedications and add them to the pool. You can view other people’s here. If you send yourself a copy of the image you create then you’ll have a URL to it like the one for the image above. Feel free to post a link to your creations in the comments. Here is another Lifehacker feature for you by yours truly: Unique photo gift ideas. Note the kid illustration. That’s me. :) I decided to live out the 15 minutes of baby fame I never got back when. Once back at my machine, I’ll post the image on Flickr in full size and will add a link here, in case you’re curious. UPDATE: I’ve posted the images: greeting card, movie poster. Gone are the days when you had to clip letters from different newspapers and magazines to get a mix of fonts. This nifty tool lets you write out words with letter images from Flickr. (I assume the images have to be tagged with a letter to be part of the pool from which the program draws photos.) If you don’t like a particular letter design, you can click on just that one to get a different image. It occurs to me that perhaps this tool should be called Clipr. Retrievr is an interesting experiment in matching up people’s sketches with photos on the photo-sharing site Flickr (granted, for now limited to a small segment based on interestingness). There is definitely room for improvement, but it’s an interesting idea even if a bit off the mark regarding the matches for now. I tried the service by creating some sketches of Christmas trees thinking there should be plenty in the recent Flickr pool. Of these four, only the last one yielded any Christmas trees as results (only one of which was not itself just a drawing). The other hits were pretty random both in terms of shape and color depicting anything from cats and birds to close-up shots of flowers. One architecture image did make sense since it really does look like a tree (as noted by its creator in the photo’s title as well). I played around with the system a bit more and realized that it may be most interesting for retrieving pictures based on color distribution. A blue-orange square yielded photos dominated by related colors. It’s easy to find photos on Flickr based on topic (e.g. using tags or groups), but less obvious to find images based on color combination (there are exceptions, but these modes are less widespread). It is perhaps in that realm that Retrievr holds the most promise for now. .. when you’ll be getting more solicitations than usual from organizations asking for your donations. Obviously, there are lots of worthy causes. I thought I’d put in a plug for Creative Commons. They are having a Fall fundraising drive. John Quiggin over at Crooked Timber had a helpful post about Creative Commons as a default rule a few months ago. This would be a good time to catch up on that reading if you missed it. One of my favorite applications of CC is its use on Flickr. I use the Attribution-NonCommercial-ShareAlike License as the default in my photostream. Occasionally I’ll change it to Attribution-NonCommercial-NoDerivs. But so far I have come up with no reason to post anything specified as All Rights Reserved. It is really heartening to see that millions (over six million and constantly growing) of photos on Flickr are posted using a Creative Commons license. Of course, many many are posted under the traditional circled C license. I sometimes wonder if at least some of those people opted for C over CC, because they don’t know enough about the latter. If I hadn’t known about CC before starting to use Flickr, I am not sure I would have thought to or gotten around to specifying the above-mentioned licenses. Larry Lessig comments that one of the reasons CC launched such a fundraising campaign this Fall is that the IRS requires this kind of public support for non-profits in addition to donations they may get from foundations. Please consider supporting this cause. By the way, Rune T has got to be one of the most exciting Flickr contributors so be sure to visit there! You are currently browsing the archives for the Creativity category.